If your house has a spare bedroom which you tend to leave unused until guests arrive, that room could easily become inadvertently neglected. However, it would be inconvenient if any issues with that room are only detected by friends or relatives when they arrive for an overnight stay. Therefore, you should prepare that room well before it is actually needed – and here are some things you can do to help make it feel more like home for people who stay there. What are the little things that your potential guests love about their own homes? Good examples for a bedroom can include comfortable linens and pillows on top of a good mattress, all of which you should place inside the bedroom to provide a foundation, says Better Homes & Gardens. The trick is to make the room feel like a hotel: slightly impersonal while remaining genuinely welcoming. To that end, laying down soft carpeting can also help by warming the floor. When a guest arrives, you could inform them of your home’s Wi-Fi password and thus allow them to readily access the Internet on their phone or tablet without needing to dip into their cellular data. You could also, in the room, leave a charging station for the guest to use. After all, if they have had a long journey on the way to your residence, their devices could be running low on battery and so benefit from being recharged overnight. If a guest wakes up overnight feeling parched, they could feel like they are seriously inconveniencing you if they need to not only head downstairs but also fumble around the kitchen to figure out where the cups are. In the process, they could inadvertently wake you up, after all. 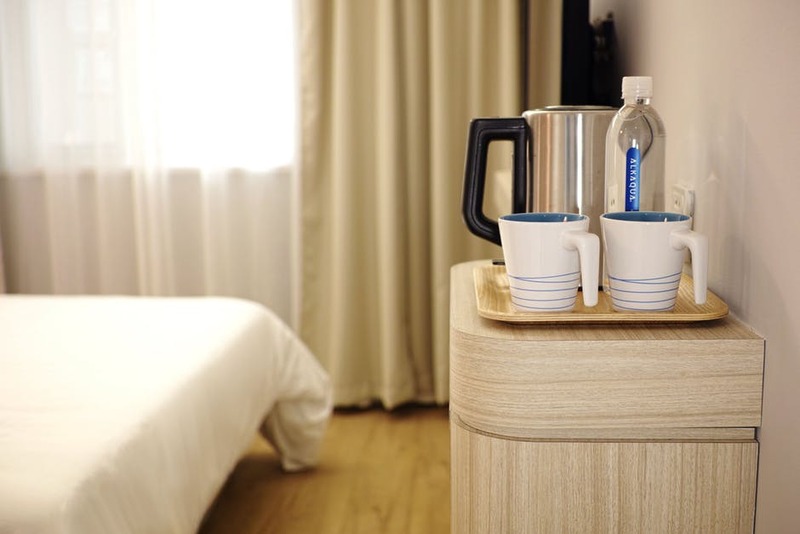 You could spare all such awkwardness by leaving a pitcher of water alongside glasses near the bed, therefore ridding your guest of the need to even leave the room if they want to replenish. Check the guest bedroom’s cupboard and leave at least half of it empty except for many open hangers on which guests could quickly hang their own clothes. Freeing up storage space in this way can tip the room into “home away from home” territory, says House Beautiful. The site advises that you leave some of the room’s dresser drawers available, too. One common issue with leaving particular rooms empty for extended periods is that these spaces can be especially prone to collecting dust. Fortunately, you can heed advice from Good Housekeeping by fully lighting up the room and pulling up blinds to let yourself see settled dust. You can then, with a microfiber cloth, wipe furniture tops, headboards and frames. If you also see water dripping from the ceiling, a Google search for “roofing repair companies near me” could help. Why Should Girls Have All The Fun? Are You Having A Divorce? This Might Help You!